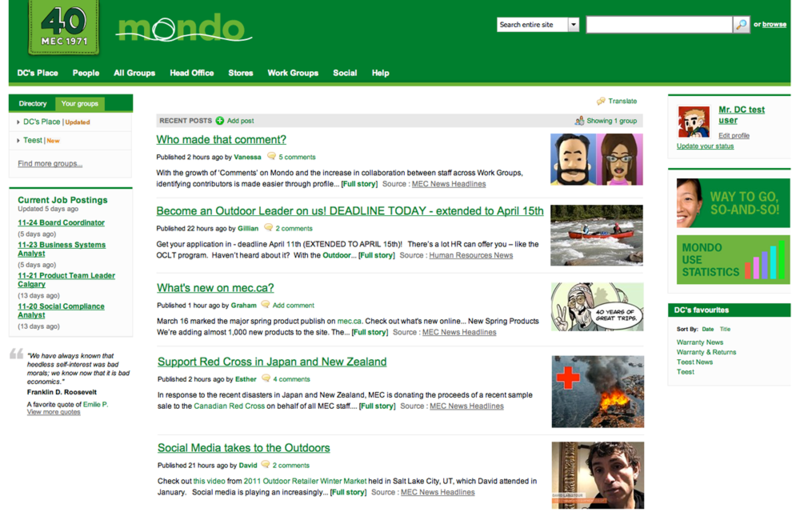 MEC’s social intranet, Mondo, is helping bring the company together from coast to coast as never before. An organization’s culture—the values it projects, the passions and beliefs its members share – may evolve organically, but at some point it becomes a crucial asset, an essential part of the brand. Mountain Equipment Co-op (MEC), the venerable Vancouver-based retail co-op that started selling climbing gear in 1971 and now purveys outdoor equipment of all kinds, knows this perhaps better than most. 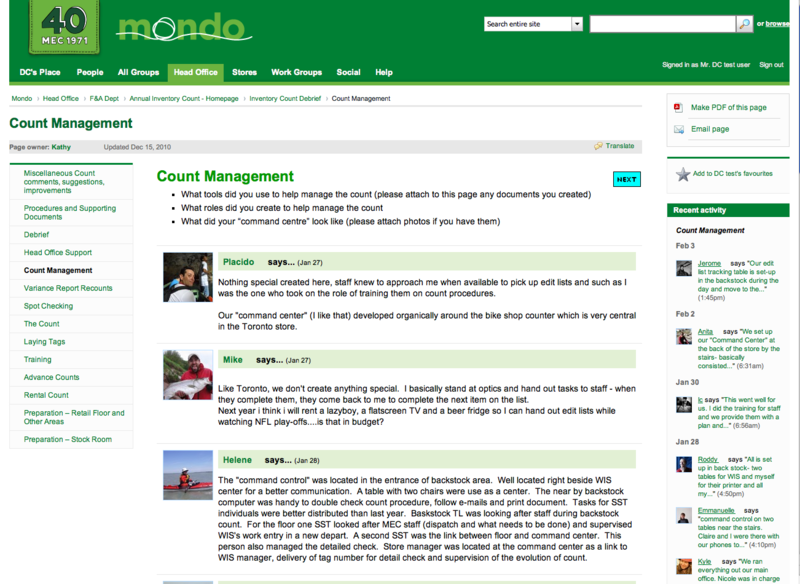 Mondo’s Intranet Manager explains the impact of ThoughtFarmer at MEC. The distinctive MEC culture was built and continues to thrive on a strong set of founding values: environmental sustainability, co-operation and collegiality, and of course, a passion for the great outdoors. So after it saw rapid expansion over a few years in the mid-2000s – the co-op now has 14 retail outlets across Canada and 1500 employees – MEC realized it needed to overhaul internal communications and cultivate a more collaborative, two-way style to help knit together its far-flung organization. By at least some tangible measures, though, Mondo is more than meeting objectives. In the six month period from October to March, 2011, users created 9451 pages, made 7932 comments and attached 3198 documents. And this has been, to a great extent, a grassroots phenomenon. While head office groups seeded the intranet with essential corporate information, anybody in MEC can create pages – and a gratifying number do. But in ThoughtFarmer organizations like MEC that commit to universal access, those percentages shift to a much more inclusive 10%, 20% and 70%. 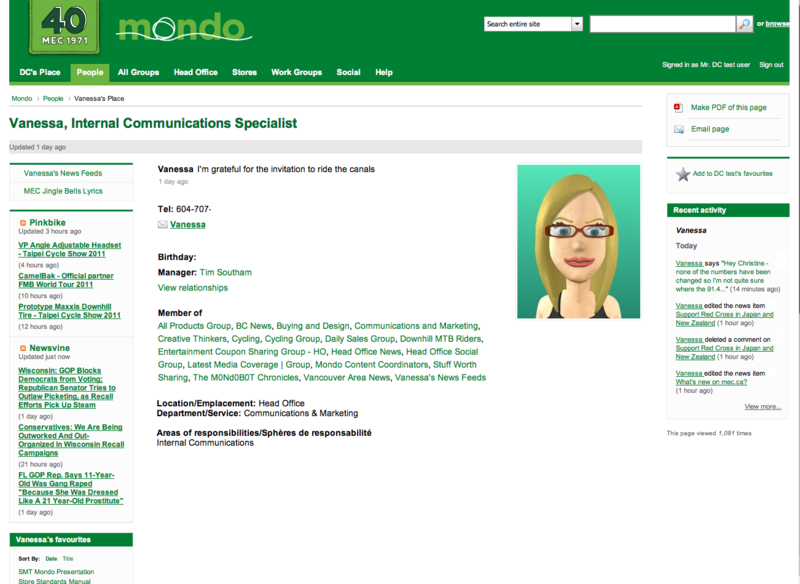 The project team did set a reasonably aggressive target for adoption – 75% of employees using Mondo regularly. It has already exceeded that target. A key breakthrough came when MEC made its intranet available to employees at home over the internet. This was important because many are front-line retail staff who don’t have company e-mail addresses, computers or desks. “They had no real access to organizational information of any kind if they didn’t make it to a meeting or read a bulletin board,” Parsons says. 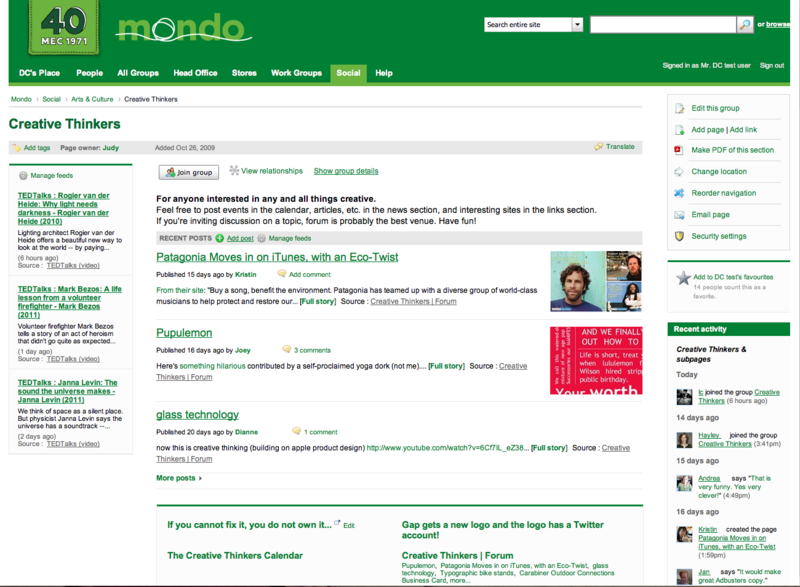 The company’s strategy was to make Mondo an essential tool for everybody so even part-timers who only come in to work once or twice a week would be obliged to use it. It moved key functions to the intranet, such as shift scheduling for retail staff, using ThoughtFarmer’s calendar functionality. Human resources and other departments posted essential company documents and set up forms – for staff to request time off, for example. 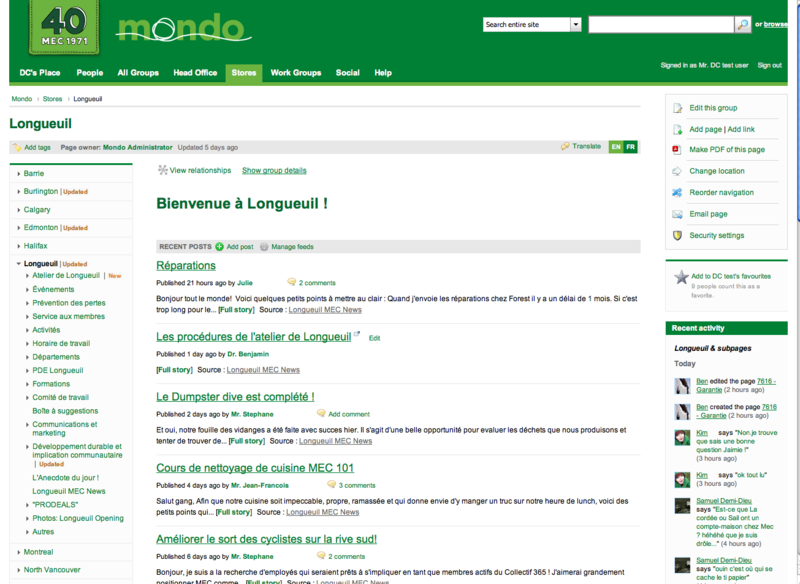 “There are hundreds of forms up on Mondo now, and being used,” Dubuc says. The operations group in particular, led by über-user Dan Eagen, the department admin assistant, set up a number of new automated processes, sometimes using Logiforms, a third-party open source tool for creating interactive forms that can be embedded in Mondo pages. One for example makes it easy for any store employee to initiate stock replenishment when she sees a low-inventory situation. And while they’re there – checking schedules, requesting time off, reordering product – employees are inevitably drawn into the other things going on: the lively forums and interest groups, many of them purely social, that have sprouted around everything from food and drink, to gardening, to cultural pursuits and, of course, outdoor activities of all kinds. “As a cultural reflection of the organization,” Parsons notes, “Mondo has been very successful.” But it’s more than just a reflection of what was already there. Employee engagement is not just a vague touchy-feely concept. “There is all kinds of research showing a strong correlation between employee engagement and overall organizational success,” Parsons points out. 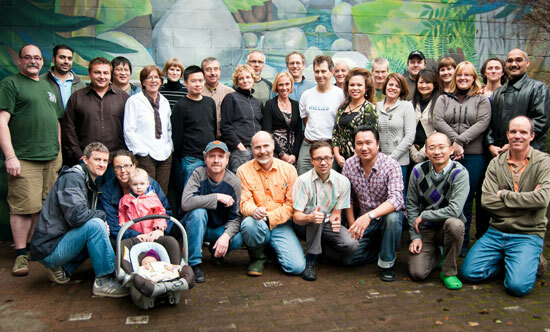 MEC conducted an employee engagement survey five months before launching Mondo, and plans another for May or June 2011. “It will be interesting to see the impact Mondo has had,” she says. The engagement is not just between employees and the organization either, it’s also between individual employees in different locations – something that was impersonal at best in the past, mainly based on e-mail, or simply didn’t happen. Because employees can see their distant colleague’s pictures and profiles at their personal pages and read their off-the-cuff comments in forums and interest groups, they feel they know them a little. There is greater ease, more banter and sociability in the business communications, Dubuc says. Bottom line: people work better together. While Mondo is meeting MEC’s broad philosophical objectives, it is also delivering more practical benefits, some of them actually quantifiable. Eagen points to the stock replenishment app, for example. In the past, the process was opaque and imprecise. Employees had to know who the right person was in their store to go to with an out-of-stock or low-stock situation. Then reorders had to be organized and sent in batch mode. Now any authorized employee can go to a forms-based Mondo page at any terminal in the store, or even from home, and note product name and stock level. Mondo is also saving Eagen and his colleagues time. The operations department needs to communicate with employees on all kinds of matters, especially upcoming events, both business and social. When the annual store inventory-taking approached, for example, he would put together a 50-page Word document with instructions and guidelines, e-mail it to every store and then field dozens of often repetitious e-mail queries over the next few weeks. Now Eagen can make a few modifications to the information created the year before, relink it at the site and field enquiries in the comments section of the page or in a forum set up for the purpose. MEC’s human resources group loves the fact that having HR information easily accessible on Mondo means a reduction in time-consuming phone and e-mail enquiries. In fact, employees are sending fewer e-mails overall. “We’re seeing some real behavioral change there,” Parsons says. It’s not just communications between head office and field. The real pay-off in efficiency and productivity comes when communications move sideways and employees start solving each other’s problems in forums and comments sections – and that is happening all the time now. For example, an employee in one store is having trouble assembling a tent for display because the manual has gone missing, so he posts in a relevant forum about it – and an employee at another store scans and sends him the manual or tells him how to proceed. And it’s not a huge leap from there to generating real business-altering ideas from this kind of informal business networking. “One collaboration of this kind might yield a thought or idea that could be worth quite a lot of money,” Parsons says. 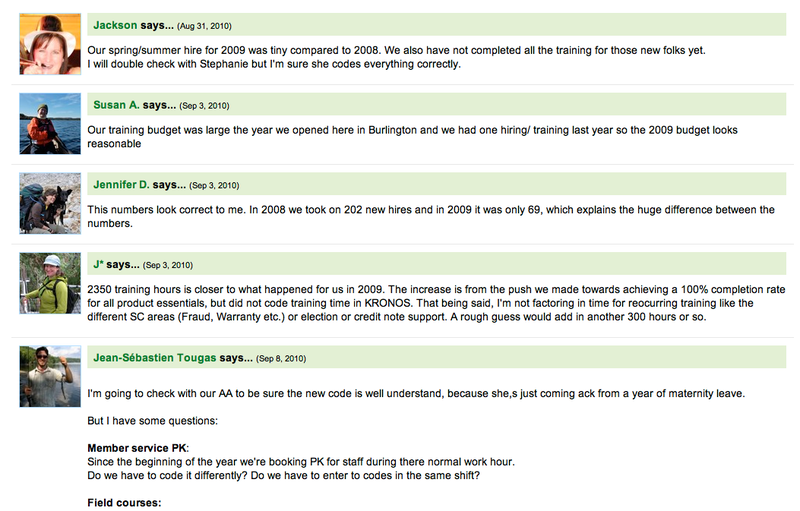 MEC took finding the right intranet solution very seriously. It chose ThoughtFarmer over competing solutions, including Microsoft SharePoint and the open source Drupal, after an intensive requirements gathering process that included visits by IT staff to every store, and exhaustive market research, followed by a formal RFP. The big reason MEC chose ThoughtFarmer: ease of use. “Right out of the box, it was very easy for people to see how to create sections and pages,” notes business analyst Jan Mazereeuw, a key player in the selection process and implementation. And it could handle MEC’s bilingual requirements with ease, something many competitors could not do well or at all. Not that MEC is uncritical or willing to let ThoughtFarmer rest on its laurels. Dubuc would like to see better built-in e-mail functionality, for example, and enhanced integration of ThoughtFarmer calendaring with third-party calendar programs. While the ThoughtFarmer team has generally been responsive to requests for enhancements and modifications, Dubuc says, MEC has a long list of suggestions – some of which, he admits, may not be universal enough in their applicability to other customers to warrant immediate attention. In the meantime, the tool is doing what MEC expected and hoped. While there are some quantifiable returns in increased efficiency and productivity, the real payback is more strategic and long term.